It seems like Sherlock Holmes is everywhere these days. There's the BBC Sherlock (which outshines everything else by a million watts, in my opinion). There's CBS's Elementary which is a blatant Sherlock rip-off (whose differences from the BBC version seem to be largely motivated by a desire to avoid a lawsuit by the BBC,) but is still a lot of fun. And there's also the two Robert Downey Jr movies from a few years ago. Not to mention the Arthur Conan Doyle originals. If you're a fan of any incarnation of Sherlock Holmes, you will love The Beekeeper's Apprentice. It is shelved in the Adult Mystery section, but this first novel features a teenage protagonist named Mary Russell who meets the now-retired Sherlock Holmes (he's in his late 50s). It's set during World War I.
Mary, in many ways, is a female Sherlock Holmes. I imagine that Holmes was very similar in disposition to Mary as a youth. She is a character largely ruled by logic. She is haunted by personal tragedy, but unlike most teenage characters, she does not let this define her. Mary is intelligent, forthright, and confident. Over the course of the novel (which takes place over several years), Holmes serves as Mary's most important mentor and friend. But through it all Mary maintains beliefs and activities staunchly opposed to those of Holmes. She does not allow herself to be defined by Holmes, which I think makes Holmes like Mary even more. The Sherlock Holmes of this series very closely follows the Sir Arthur Conan Doyle's character. This Holmes can be abrupt, intellectual, and brush off those who bother him without a second thought. At the same time, he is charming, enjoys culture, can be passionate, and fully fits into society when he chooses to do so. He is far less of a "high functioning sociopath" than Benedict Cumberbatch's Sherlock. *On a side note, I am impressed that King manages to create a close relationship between a 15 year old girl and a 50+ man that is truly a partnership of equals and doesn't have any of the creepiness that you might expect from such an age gap. The story itself is less interesting to me than the character development, but was still a solid mystery. The mystery part actually takes a long time to show up. The first half of the book is focused on establishing Mary's character and her burgeoning friendship with Sherlock. Eventually the mystery shows up as an American Senator's daughter. She's rescued but then Holmes and Mary have to discover who is behind it. The specifics of the mystery are a bit fuzzy - like I said, I really wasn't reading this book for the mystery. But it features what you come to expect from a Sherlock Holmes book: disguises, travel, narrow escapes, a big villain, etc. Also like traditional Sherlock Holmes, the mystery feels like an intellectual exercise in deduction more than it does chasing bad guys. Laurie R. King's Mary Russell series has won over a mystery hater like me. (Well, actually Benedict Cumberbatch won me over to anything Sherlock related, but still). As someone who is in love with Sherlock Holmes and also enjoys the Edwardian era, I loved this story. Best of all, it features a strong female lead who never takes second fiddle to the brilliant Sherlock Holmes. I wasn't well versed in Sherlock Holmes until very recently when I read Doyle's The Lost World and thought I might like his writing style after all. 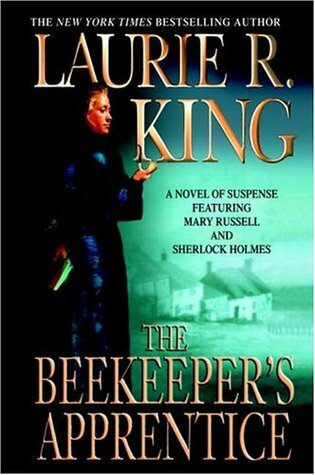 I'd been reading The Adventures of Sherlock Holmes and The Beekeeper's Apprentice together, but had to put the latter on hold. I enjoyed Doyle a lot, and won't be revisiting this till I finish reading all the originals. I have to say it took me a lot longer to like Mary than it did to like Sherlock, which is funny, because they're pretty similar like you've said. The fact that it is a series is also a bit intimidating. Do you plan to read the sequels? I do love that stories keep getting added to the Sherlock Holmes ouvre and that this new heroine is like a female Holmes, despite her being just 15 (thank goodness for no ick factor with the much older guy!!). Another Sherlock Holmes series huh? since I have been addicted to Mr. Benedict Cumberpatch, I do want to pick up some books on Sherlock. I haven't read Doyle in a long time! And I haven'r read any of the new Sherlock stories (But I do love both the BBC Sherlock and the US Elementary) Love that this story features a strong young female character! You said that it is not a YA book. But, is it appropriate for teens? My daughter is a big Sherlock/Elementary fan! I read and loved this book a few years ago. I had planned on continuing the series but then I got distracted. Now that Sherlock is done for another season (I wish there were more than 3 episodes! ), I'll have to pick this one up. I agree that I was also a bit worried about their relationship but I loved when Mary gains Sherlock's respect and admiration. When I first read this novel I didn't even calculate the age difference between Mary and Sherlock. My sister, who is a bigger Sherlock fan than myself, pointed it out to me after she finished it. I've read the first three books in the series and they are all delightful!